Always up-to-date with the AchemAsia 2016 App! Languages are English and Chinese. Access to all exhibitors from A-Z with a short profile of their business fields or products, searchable by name, target group, product category and country. Overview plan of the exhibition grounds and detailed hall plan make it easy to find the stands of interest. Interested in Mobile Marketing? This service can be ordered from February 2016. 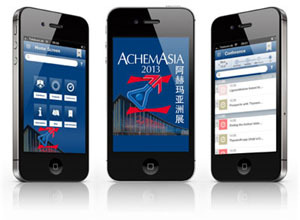 The AchemAsia App will be available from mid April 2016!